Gelato is Italian icecream, this frozen dessert ressembles very much like icecream as most of the ingredients for making gelato goes almost for icecream. Gelato is prepared with milk,cream,sugar,fruits or nut puree as main ingredients as they are prepared by heating process. 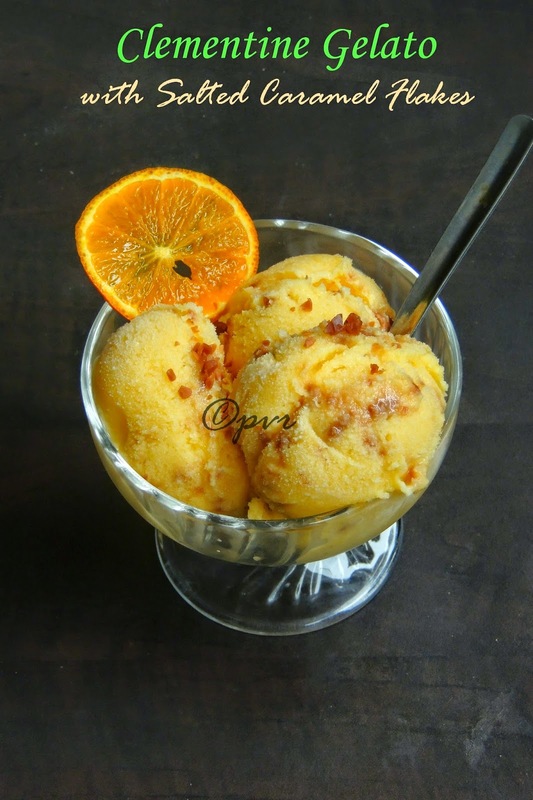 Eggs are used in this Italian icecream for giving a smooth texture to Gelato. But i tried making mine as eggless. Icecream maker is not need for making this homemade gelato, yes you can prepare gelato by using your blender. Since my theme for this week's blogging marathon is Summer specials,i couldnt resist to post this fruity gelato with salted caramel flakes i bought recently from our weekend trip. 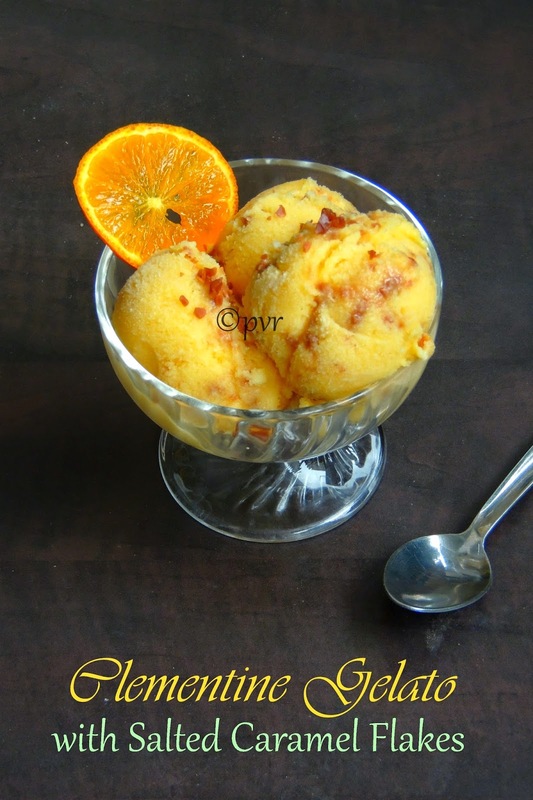 Clementines, this vitamin c rich fruits were sitting in my fruit basket since few days, as none want to have it either in salads or just like as segments, i finished them making this super fresh gelato as eggless ones with caramel flakes, the addition of caramel flakes makes this gelato more interesting and we loved having them after our lunch. A simple and very refreshing dessert to enjoy while the weather is hot outside.Since homemade icecreams or gelatos are preservative free, they can be consumed without any guilt.Whipping cream is important here, dont skip it for any reason.Check out the Blogging Marathon page for the other Blogging Marathoners doing BM#41. Bring to boil all the ingredients except the whipping cream, let the syrup gets thickens and put off the stove. Strain the syrup and keep aside until its gets cool. Stir in the cream and pour the mixture in a stainless steel bowl and freeze for an hour. Whisk the mixture in a blender and arrange again in freezer. Whisk twice every 2 hours, now add the salted caramel flakes, mix with a spoon and let them sit in freezer for overnite.. While serving,keep the gelato in fridge for few minutes. What an apt dish for summer! Love the flavors esp the salted caramel! Wow this is a treat..Priya if we want chocolate flavour how do you go about? @vaishali sabnani Same method, instead of fruit juice, increase the water, sugar and add chocolate chunks or chocolate powder, melt or bring boil and let it cool, then proceed the same way with the whipping cream,hope this helps. Delicious gelato, looks very yummy and tempting.. This would be so yum for this weather! What a great combination of flavors! Very appetizing. so perfect for summer!! very refreshing and soothing!! woww lovely combo,looks soo tempting!! Wow Salted caramel must taste divine in ice creams. Lovely recipe. Such a tempting and delicious gelato. Love that combination -- yumm.. yumm..